Alex Garland's adaptation runs the risk of alienating diehard fans of Jeff VanderMeer's novel, but it's the rare film that improves on its source material. 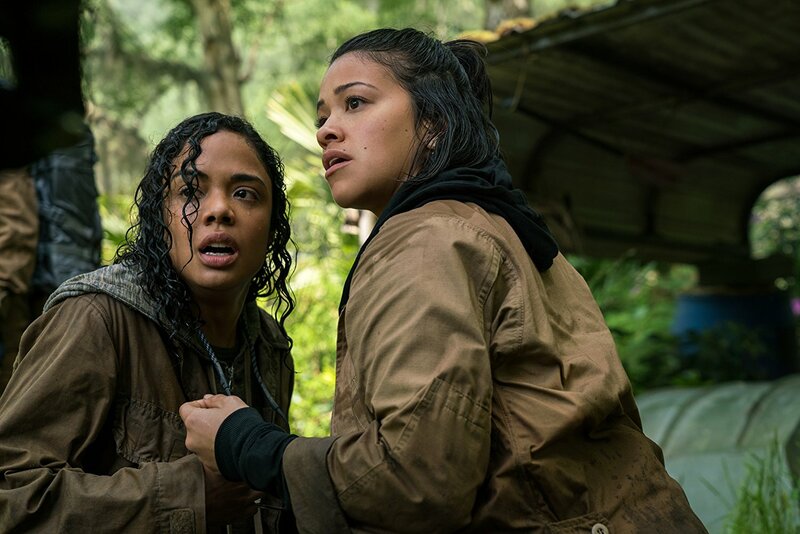 As with any movie based on a novel, the new sci-fi horror feature “Annihilation” differs from its source material in a number of ways. Filmmaker Alex Garland’s take on Jeff VanderMeer’s book — the first of an alliterative sci-fi trio known as the Southern Reach Trilogy that also includes “Authority” and “Acceptance” — is very much on the “loose” end of the adaptation spectrum, which suits the movie well: There’s a lot about the novel, which is rich in ideas but intentionally vague about certain details, that would have been exceptionally difficult translate to screen. As for what Garland actually changed, the short version is “a lot.” The long version contains massive spoilers for both versions of this weird tale, so be forewarned. It gives the main characters names. In the novel, the team we follow are known simply by their titles: the biologist, the psychologist, the anthropologist, and the surveyor. Here they’re named Lena (Natalie Portman), Dr. Ventress (Jennifer Jason Leigh), Anya Thorensen (Gina Rodriguez), and Josie Radek (Tessa Thompson), respectively. The film also adds a character: Cass Sheppard (Tuva Novotny), the linguist. It alters the main character’s ethnicity (sort of). “Authority” reveals that the nameless protagonist of “Annihilation” has “high cheekbones that speak to the strong Asian heritage on one side of her family.” Garland began working on his film (including casting Portman) before that book was released, meaning he wasn’t initially privy to this information. The decision hasn’t been without controversy. It changes the name of the fantastical setting. Known as Area X in the novel, the otherworldly setting of Garland’s film is referred to as the Shimmer — a more evocative moniker, to be fair. “Area X” shows up as a title card just before Portman’s arrival in the exotic locale, the sole reference to its original name. We know from the moment “Annihilation” begins that Lena has returned from her mission; that’s a departure from the source material in and of itself, as is the manner in which Garland fills us in on key details from her pre-Shimmer life: frequent jumps between the past and present. It changes the meaning of the title. We learn near the end of VanderMeer’s book that at least one of the biologist’s counterparts in the 12th expedition was given a codeword to make her unwittingly commit suicide should things go awry: annihilation. Garland scraps that morbid detail, instead using the title as a climactic, monologue-concluding term that sums up what the Shimmer does to those who enter it. It reveals less about the Southern Reach. In a lot of ways, the novel is ultimately less about Area X and more about the Southern Reach, the clandestine agency tasked with actually investigating it. VanderMeer delves into the bureaucracy and infighting behind the expedition, with each member having been programmed (in some cases unknowingly) to observe their counterparts as much as Area X itself. Garland largely ignores that dynamic. We know that Lena and the rest of her team aren’t the first to trek into the Shimmer, for instance, but they’re never explicitly referred to as the 12th expedition and the extent to which they turn on each other has nothing to do with the orders they received prior to their journey and everything to do with the fact that the Shimmer is too strong a force to endure. It changes almost every single character’s ultimate fate. As in the book, every member of the 12th expedition other than the biologist dies. How they die is quite different, however: Two of them are viciously mauled by the deadliest bear this side of “Grizzly Man,” one semi-willingly becomes part of the Shimmer in an offscreen death that’s as beautiful as it is disturbing, and another appears to explode in a cloud of pure energy. There’s also Oscar Isaac’s character, whose literary basis dies of cancer shortly after returning from the 11th expedition. Here his return and subsequent coma prompt Lena to venture into the Shimmer, and once she’s apparently defused its power he wakes up feeling right as rain — only it isn’t actually him, but rather a doppelgänger born of the Shimmer. …and invents a few of its own. It completely, utterly changes the ending. VanderMeer’s novel ends with the biologist choosing to stay in Area X so that she might learn more about what happened to her husband. Garland’s biggest departure comes here: His version ends with Lena encountering a refracted, Shimmer-created version of herself and destroying it (or not) with a phosphorous grenade after gazing into a psychedelic void that either reveals the mysteries of the universe or nothing at all (if not both). From there she returns back to base, where she’s reunited with the being she knows isn’t really her husband. VanderMeer himself has chimed in on this, calling the ending “so mind-blowing and in some ways different from the book that it seems to be the kind of ending that, like ‘2001’ or something like that, people will be talking about around the watercooler for years.” It’s an ambitious, bravura finale, one that represents a huge departure from its source material — and may make future adaptations of “Acceptance” and/or “Authority” even more difficult than they would have been already. All of this is likely to alienate fans of the novel, but Garland has crafted the rare movie that improves on its literary source material. He’s made vivid what often felt vague on the page, committing to his idea of what the Shimmer represents rather than falling back on a Lovecraftian notion of unknowability. Two more films in this series would be welcome, but “Annihilation” is so affecting on its own that they would also be unnecessary.